Listen here to the enchanting tenor chorus song of trumpeter swans. 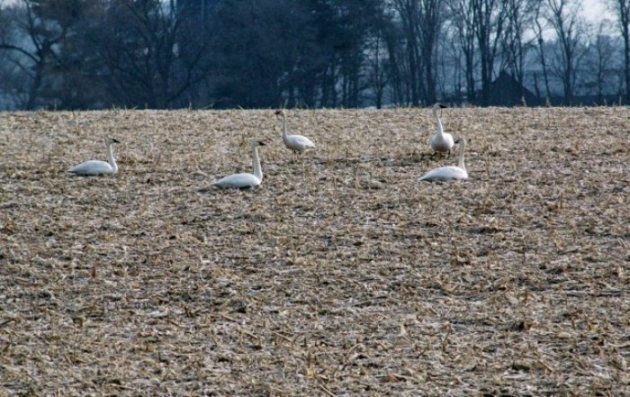 This small flock of trumpeter swans has been visiting a picked corn field near my home every day during December to feed and rest. They announce their arrival and departure with the sounds you can hear by clicking on the green symbol above. There is no other similar sound in all of nature. To me, they sound like cars honking. But to whomever named them, they sounded like trumpets. What makes the trumpeters all the more enchanting is the fact that their numbers dwindled to less than 100 in North America in the early 20th century. There were no game laws to limit their killing. Their down and their eggs were highly prized. The Migratory Bird Treaty began their protection in 1916 and it continues today. Owing to nearly a century of protection from the gun, trumpeters are considerably less wary than other waterfowl. You can see in the photograph how close they let me approach before flying. And, once airborne, this flock turned and flew directly over me, curious about the perceived threat. This flock of five is often joined by ten other swans including a few still-grey yearlings. Young trumpeters are called cygnets; the adult males are called cobs; and the adult hens are known as pens. Swans can live up to 30 years in the wild and grow to 35 pounds, making them the largest of all native bird species. A low fly-by, with wings extended to their full eight-foot span, is truly spectacular. I have no idea where these swans are finding open roosting water in Northern Washington County this time of year. Even in this non-winter, the St. Croix River is locked in ice as are all the local lakes. But wherever they are staying they are certainly welcome guests in our neighborhood. Bill Klein is a lifelong lover of the outdoors. He's passionate about mentoring children in a wide array of outdoor activities and teaching respect for the land and landowners. He lives on a small farm in northern Washington County and has never met a dog he didn’t like. The walleye bite was hot over Memorial Day weekend on Lake Winnibigoshish. Report on pan fishing near Pine River. Thoughts on our obsession with wolves. A recently harvested mallard carrying a band leads to information about bird banding in general. Found: the ideal companion in a duck blind.